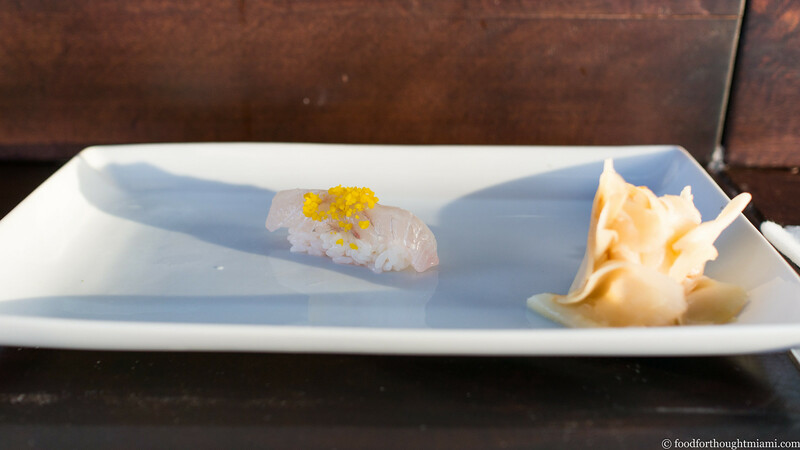 Hirame (fluke), brushed with torched sake and then adorned with grated cured egg yolk. 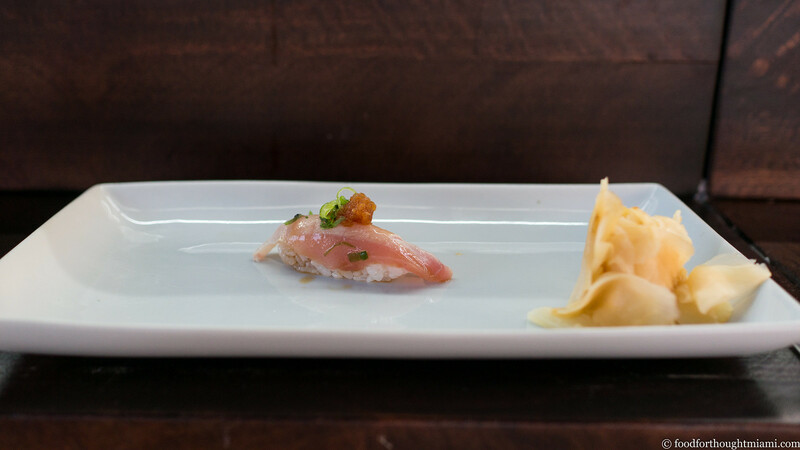 Silver-skinned, pink-fleshed kanpachi (amberjack), dabbed with spicy, zesty yuzu kosho. 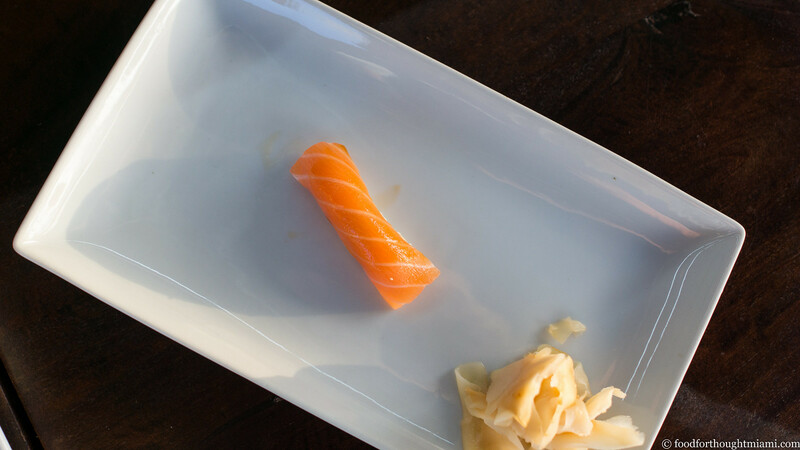 Silky, fat-ribboned sake (salmon) from the Faroe Islands (a group of North Atlantic islands midway between Norway and Iceland). 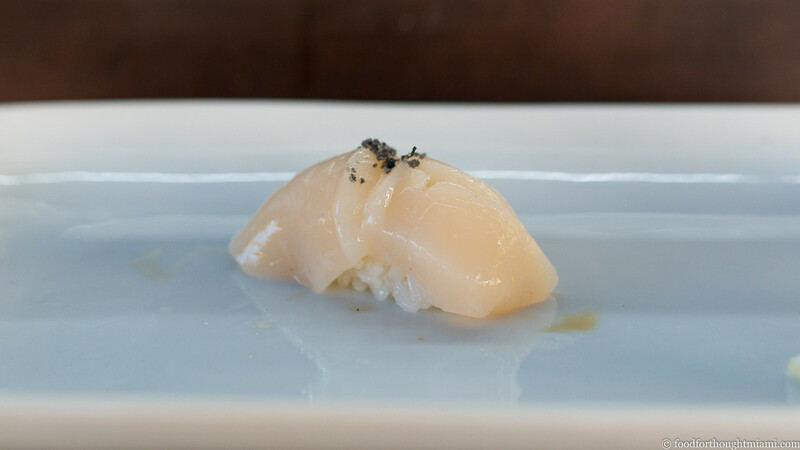 Sweet, impeccably fresh hotate (scallop) from Hokkaido dusted with black salt. Ruby-hued magurozuke (soy-marinated tuna) from Ecuador. Silver skinned aji (horse mackerel), chopped like a fine tartare with ginger and scallion, plus a sprinkle of toasted sesame seeds. 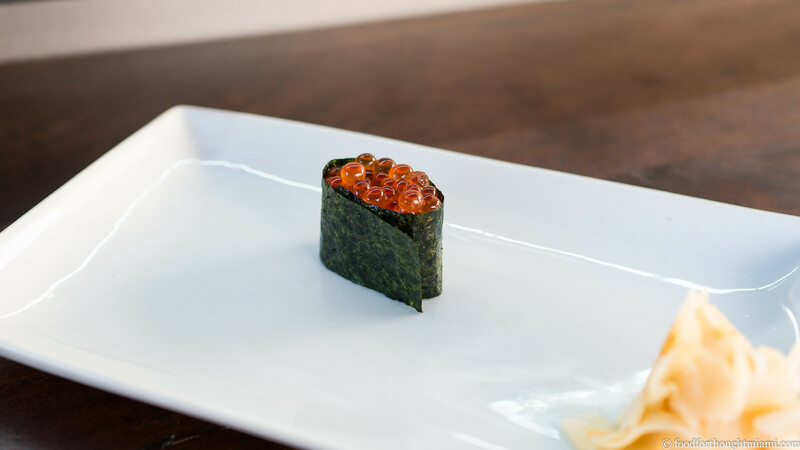 Alaskan ikura (salmon roe), glistening like little baubles. 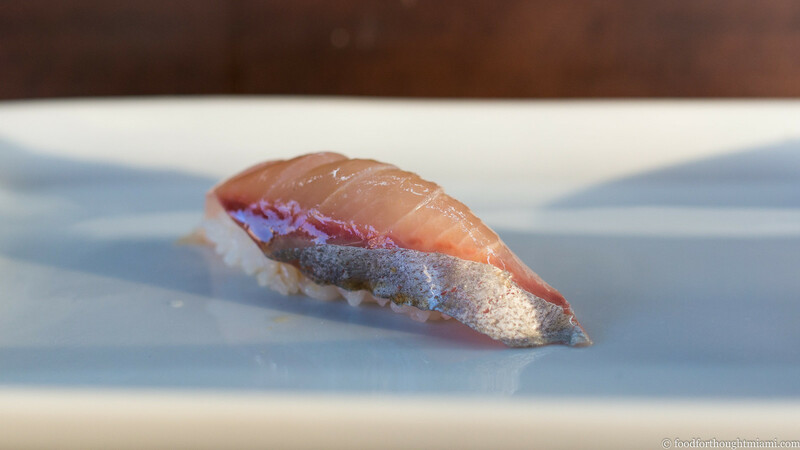 Isaki (grunt), an uncommon appearance in a sushi lineup, with a firm, sweet, mild flesh. Hamachi (yellowtail), topped with sweet onion (?) and slivered scallion, with a generous brushing of shoyu. Uni (sea urchin) from Alaska, a source I've not seen before. Jake said they were switching from Santa Barbara, whose season is petering out, and were underwhelmed by the Hokkaido uni they've gotten in thus far. 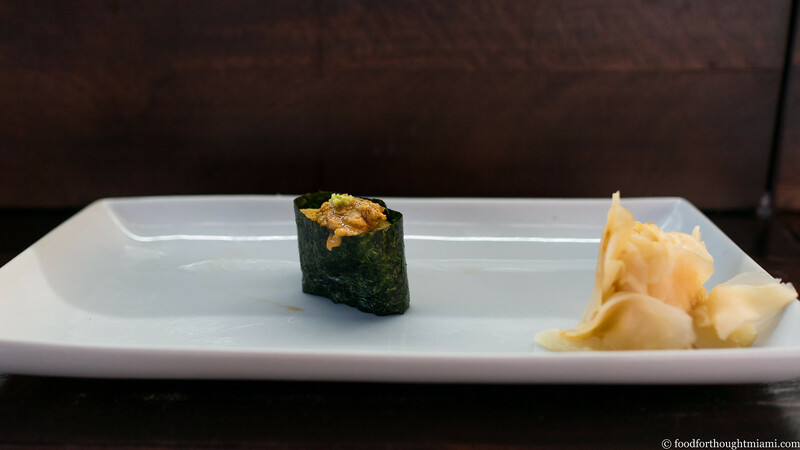 I did not get a good picture of the final round, a temaki (hand roll) of cold, finely minced spicy tuna with bits of pickled vegetable for crunch. First impressions? I was concerned the outdoor format would wreak havoc with the rice's texture, but my concerns were apparently unfounded. Myumi's rice was actually quite good: it holds together without being gummy or clumpy, preserving the distinct feel of each individual grain (though maybe just a bit dry and underseasoned to my taste). The fish is very good by Miami standards. I was particularly struck when the kanpachi had a certain "snap" to the flesh, and the knife work across the board was solid. I appreciated the creative garnishes and embellishments; but if I were to have one complaint, it would be that these were too often a bit heavy-handed. 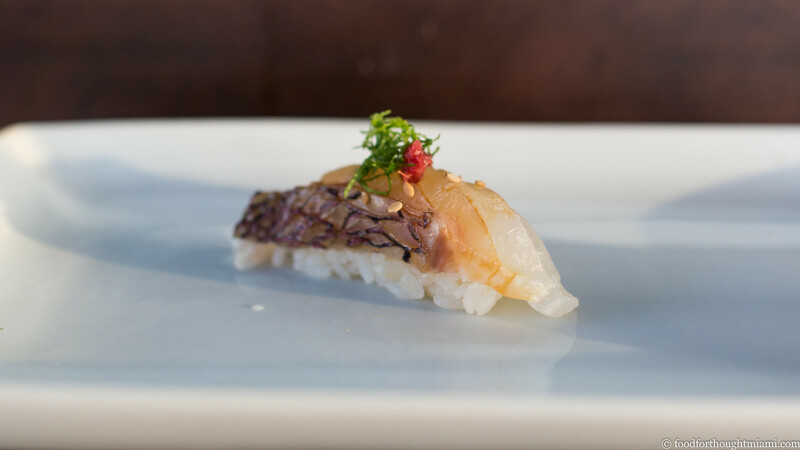 A couple items – the madai and the kanpachi come to mind – were overwhelmed by their accompaniments. But still, on the rice and the fish alone, Myumi would be better than 90% of the sushi I've had in Miami, aside from my short list of favorites. 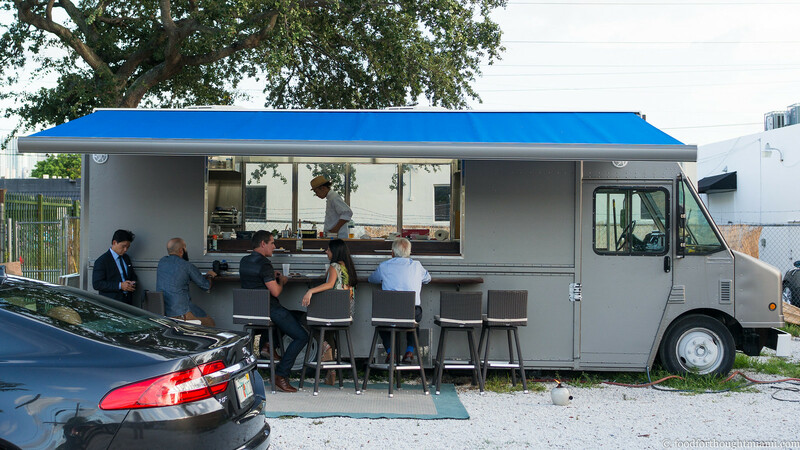 And at $60 for twelve rounds of sushi, it was a good value, considering the quality (but disregarding the fact that you're eating outdoors in an empty lot from the side of a truck, though I suppose that has its element of hipster charm). It'll probably tell you something that within two days of my first visit, I was already calling to make another reservation. Some tips: first, I'm pretty sure it is either expressly, or at least effectively, reservation only: call the number below or email reservations@myumifoods.com to book. There was no room for walk-ins when I was there on a Wednesday night. Second, Myumi is very pleasantly efficient: they aim to turn the six seats (potentially soon to be expanded to 12, serving guests on either side of the truck) every hour, and could probably easily do so if not for dawdling guests like myself. Third, it is currently BYOB, so you may wish to bring along some sake or beer (which they will gladly keep cold for you). And finally, if you're still hungry afterwards, just head next door to the gastroPod – where the spaghetti vongole (a sort of hybrid Italian / XO sauce thing) was another of the best things I've eaten all week. At their original spot on West Dixie Highway, Yakko-San nobly refused to serve sushi, only offering sashimi. 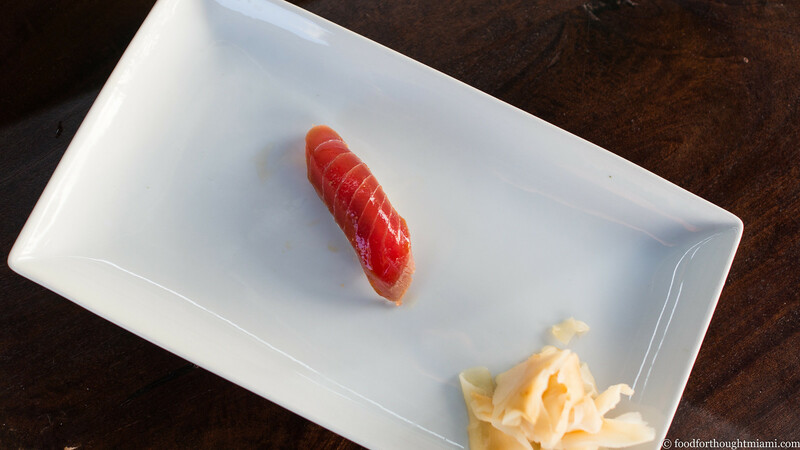 When they made the move to a much bigger space on 163rd Street, they caved in and added a menu of nigiri and rolls. 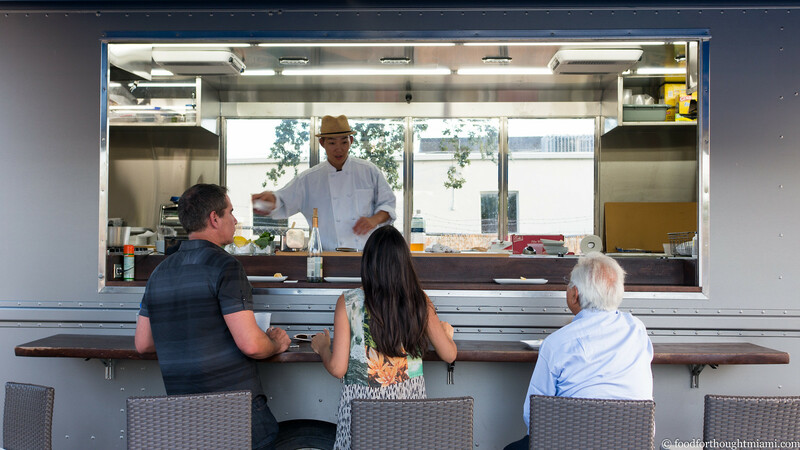 Chef Kato came from Sushi Samba on South Beach, after spending some time in New York training with Kazuo Yoshida of 1 or 8 in Brooklyn. 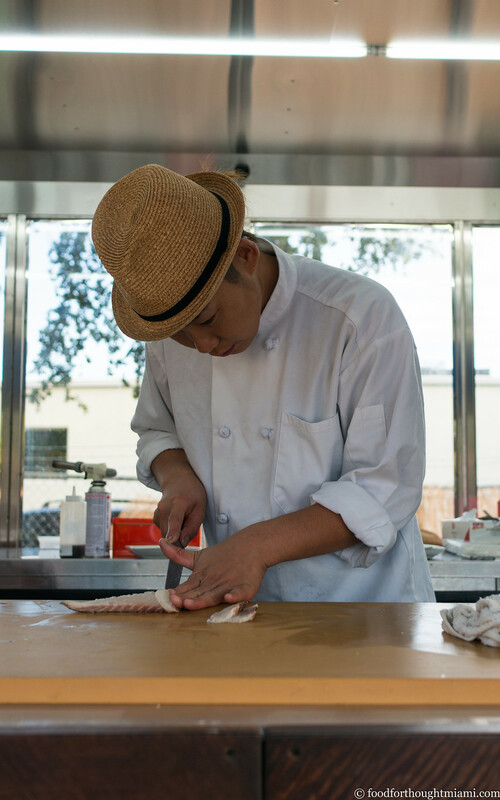 Chef Yoshida will be making periodic appearances down here every month or so, during which Myumi will offer a more extensive (and expensive) omakase menu. This whole Myumi thing has been orchestrated by Jake Smith, a former Late Night production assistant who did the same thing in the Hamptons last year, then rolled it into Miami a few weeks ago. 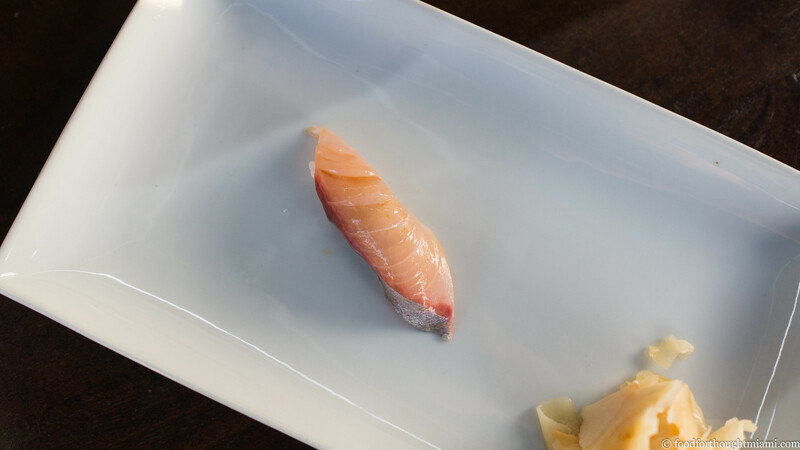 There is, I think, an underappreciated art to cutting each fish – and each piece of the fish – in a manner so that it yields nicely in your mouth, recognizing and working with the musculature and fat striations. 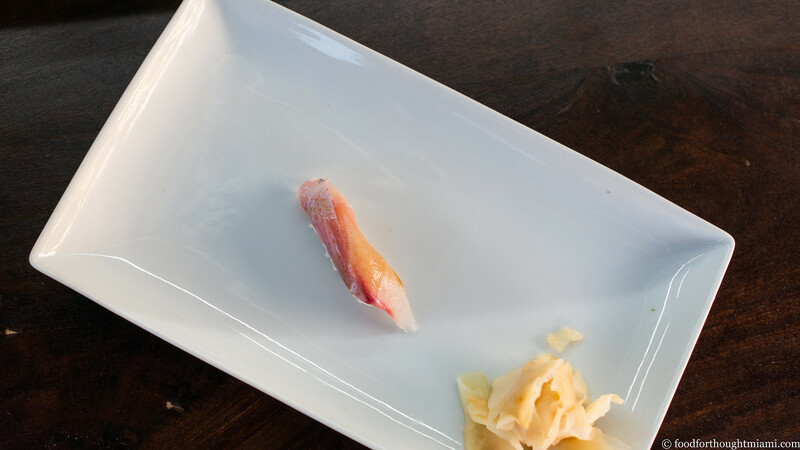 1) It seems you did not have your sushi at the bar at Morimoto. I think you would find it comparable to Makoto if you did. It is expensive like Makoto though. 2) Gastropod is not always open. I went to Myumi on a Tuesday and gastropod was closed. It seems more likely it is open later in the week than earlier. If gastropod is closed, you can always go to Coyo (if you want something quick), or Alter if you want something fancy. 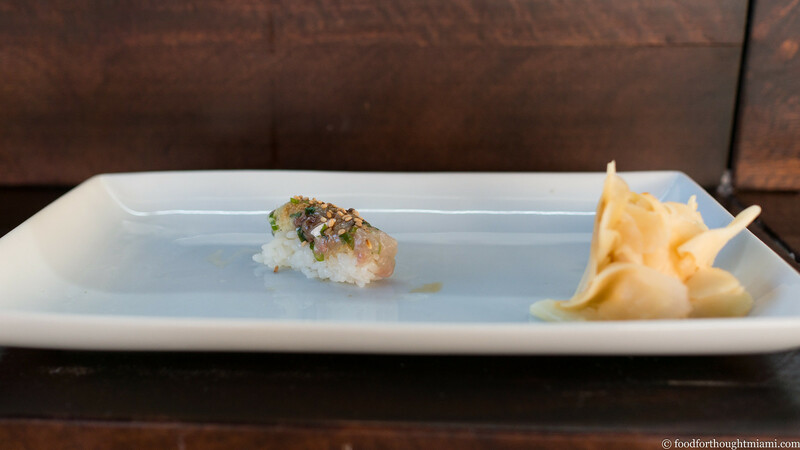 TP - we did sit at the sushi bar at Morimoto, and the sushi included in the omakase was fine, but I didn't think it was so good that I'd brave a return to South Beach and valet charges just for the sushi. I didn't think it was the same level as Makoto (though yes, the prices were).